Located 6.5km from Tobermory harbour and reached only by boat. 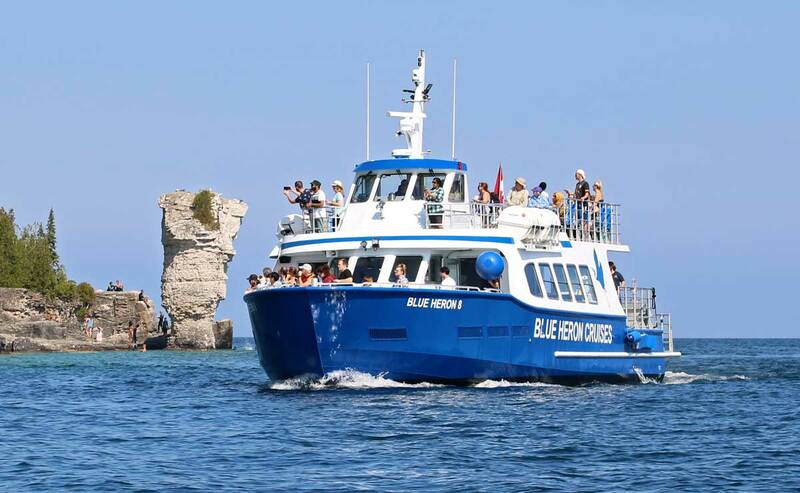 Blue Heron Cruises will take you on a tour to Flowerpot Island. 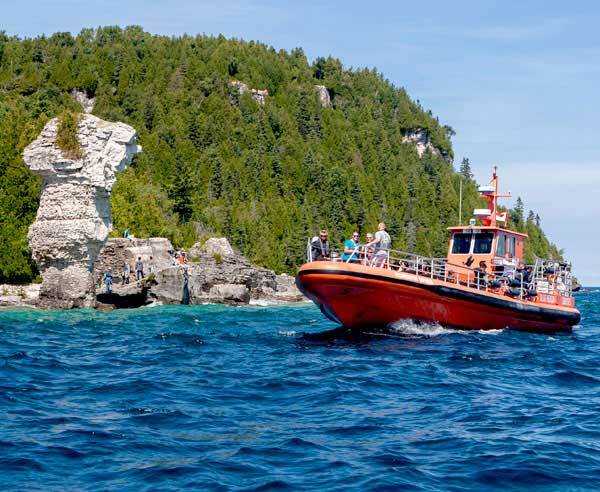 Flowerpot Island is located 6.5 kilometers northwest of Tobermory, and can only be accessed by boat. Flowerpot Island the destination of The Blue Heron 8 and Flowerpot Express tour boats. It is well worth a visit if time allows. Two hours is sufficient for a quick walk around the Island, but three to four hours is required if you want to see it all. 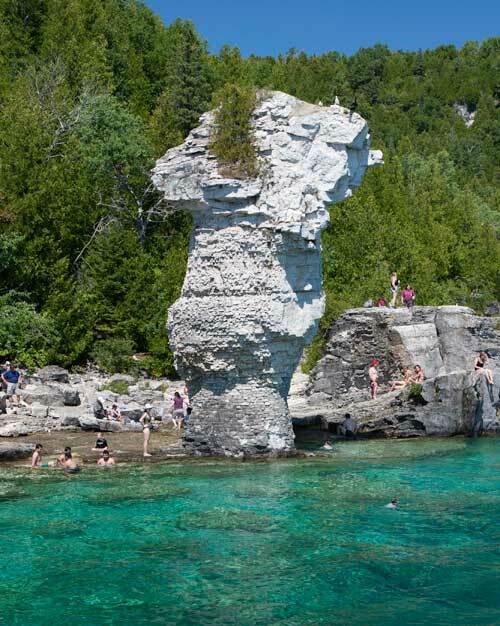 Flowerpot Island is part of Fathom Five National Marine Park and is famous for the two rock pillars or sea stacks called the "Flowerpots" on its eastern shoreline. The Flowerpots are a type of sea stack, formed over many years as wind, rain, waves, and ice hammered away at the cliff that once stood alongside the water’s edge. The softer rock eroded more quickly, leaving the harder rock remaining in the shape of flowerpots with trees growing on top. There are 4.3 kilometers of well-marked trails that cover the east side of this 200 hectare Island and limited dockage at Beachy Cove for shallow draft vessels. If you would like to stay overnight there are six campsites, or "Friends of Fathom Five" volunteers can stay at one of the old light-keepers residences. In business for almost 50 years, Blue Heron Cruises has the latest and best innovations in boat design. Our new Glass Bottom Boats have the largest glass bottoms in Tobermory as well as an upper, open air deck and a lower enclosed cabin. Move around between decks to take in a natural beauty from all angles. Our forward facing seats ensure you always have a superior view. 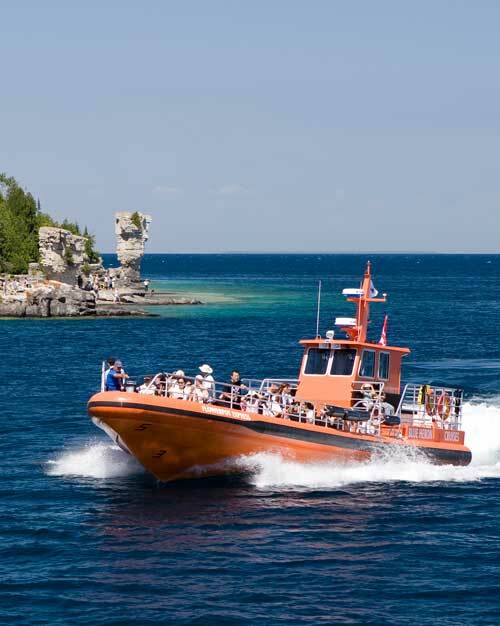 Experience our exciting open-air Jet Boat tour to Flowerpot Island, perfect for those who want to experience nature full-on! Exhilarating speed and for the lucky perhaps a little splash of Georgian Bay! 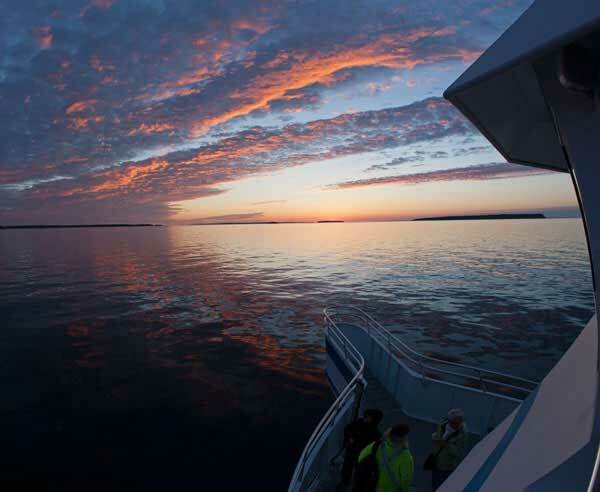 With spacious, comfortable forward facing seating, our Jet Boats take in all the scenic highlights including an excellent view of the shipwrecks. 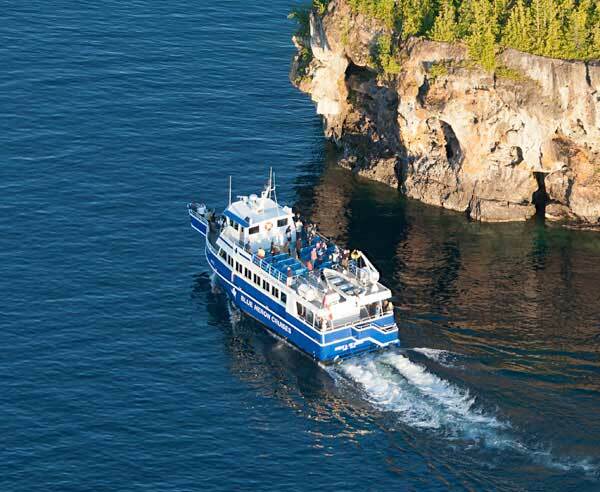 This cruise does not go to Flowerpot Island, but you can experience a sunset cruise to the Grotto and Indian Head Cove where passengers can get “up close and personal” with the drama of Cave Point.